One of our purposes over the years is to be able to deal with those wild horses that find themselves getting into trouble on private property that borders the forestry. In doing this we have been able to push some of these horses back into the forestry thereby alleviating the problem to the land owners. In other cases we have assisted some of these owners by purchasing electric fencing to secure their property. Then in other times WHOAS has assisted them by repairing their wire fences. All this has always been done in our best efforts to assure the welfare of the wild horses. Otherwise these situations would have been dealt with by another agency, which has happened, and the horses have been rounded up and sent to auction. There have been other incidents where none of these solutions were going to work and in these situations WHOAS was called upon to remove the horses through the issue of proper government permits. Although this is not what WHOAS would wish, it is what has to happen to save these wild horses. A few weeks ago WHOAS received a request from Rangeland Management, Environment and Parks, to see if we could remove a young stallion who was bothering horses on private land. This boy was definitely a problem, crashing the fences trying to get into the pens of the private landowner. No matter what, he would just not stay away and even an electric fence was not working. Therefore, there was no choice but for WHOAS to catch him up. With our experienced volunteers, we were able to coax him into a pen behind our trailer. Then we were totally taken aback when, almost on his own, he jumped in. We then transported him to our rescue/handling facility. Here, although not free, he was to begin a new life. As with all the other horses we have rescued, his gentling process has begun. The intelligence of these wild horses has shown through quickly as he has already accepted being haltered, led about and put into a stall. Before we can put him up for adoption, his gentling has to be worked on and he must be gelded. At this point we will find a suitable forever home for him. WHOAS does have an extensive adoption process to assure that the welfare of the horse is paramount. 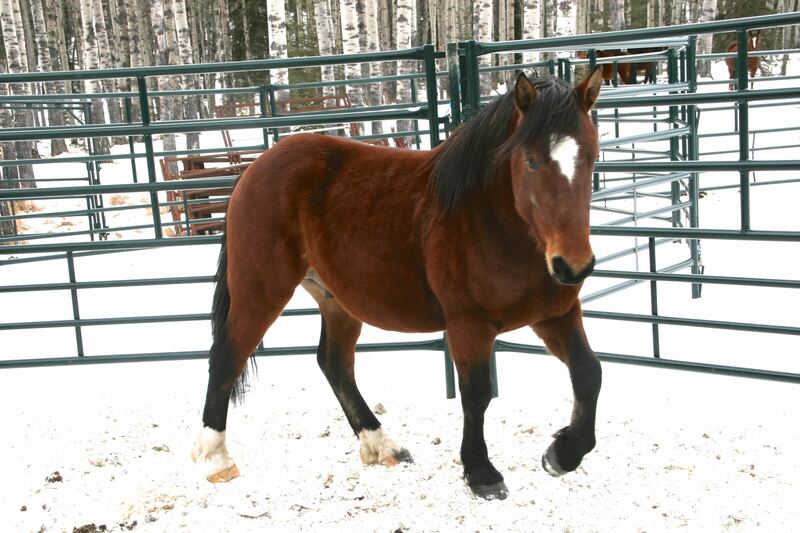 WHOAS has always been, and continues to be, committed to the welfare of all our Alberta mountain horses. We are fortunate enough to have a strong team of knowledgeable volunteers and a humane and safe handling facility. All this has been accomplished through our own funding and made possible by those who have donated to WHOAS over the years to help these beautiful creatures.